In this 2009 report, EPIC profiles 38 U.S. high schools with proven success in preparing students for life after graduation. The selected schools represent a diverse cross-section of the U.S. education system. 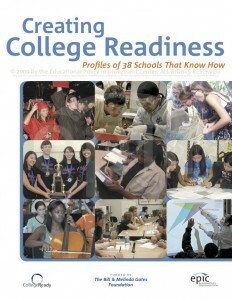 This document profiles each school and contains comprehensive and tangible examples of successful student preparation. This research was the basis for EPIC’s CampusReady school diagnostic tool. Studying the programs and practices of actual high schools that have demonstrated success in preparing underrepresented students in higher education was critical to the process of examining this comprehensive model of college readiness. To better understand the specific ways in which schools create college readiness, EPIC selected and visited 38 high schools from throughout the United States that had consistently graduated college-ready students from underrepresented groups. In June 2007, the Educational Policy Improvement Center (EPIC) was awarded a grant from the Bill and Melinda Gates Foundation to develop the College Ready School Diagnostic, a web-based diagnostic instrument. The purpose of this tool is to provide individual school profiles and customized recommendations, enabling each institution to make data-driven and systematic improvements to their programming, culture, and structure to improve college readiness for all students. This work validated and operationalized the conceptual model of college readiness developed by EPIC founder and CEO Dr. David Conley; this model was thoroughly explored in the 2007 publication Redefining College Readiness. KEY COGNITIVE STRATEGIES describe the ways of thinking that are necessary for college-level work. They include: problem solving, inquisitiveness, precision/accuracy, interpretation, reasoning, research, and intellectual openness. KEY CONTENT KNOWLEDGE refers to the need for students to master writing skills, al-gebraic concepts, key foundational content, and “big ideas” from core subjects in order to be college ready. ACADEMIC BEHAVIORS consist largely of study skills and self-monitoring. Examples include time management, awareness of one’s current level of mastery, and the selection of the learning strategies. CONTEXTUAL SKILLS AND AWARENESS, or “college knowledge,” refers to the under-standing of college admissions processes, college culture, tuition and fnancial aid, and college-level academic expectations.